The world as we know, is undergoing tremendous strain to the ecology and the environment at large which is not only threatening Man but also the ‘planets’ existence. At Ek Titli, we have been striving to feature all such initiatives that are helping change that belief and reinforce a commitment that all is not lost. We got in touch with a Swiss based global initiative that has many firsts to its credit. But for us, it is a hope that can transform our future, a future that we all wish to live; to see. Their mission is not to carry passengers, but to carry a message: If an airplane is capable of flying night and day without fuel, powered by solar energy, then let nobody claim that it’s impossible to use the same technologies for vehicles, heating systems, air conditioners or lamp bulbs! Ek Titli.Org got in touch with the people behind the World’s first Solar Airplane, capable of flying during both night & day which already holds 5 world records! Could you explain about how the solar impulse project first started? When Brian Jones and Bertrand landed in the Egyptian desert on March 21, 1999 after the first ever round-the-world balloon flight, just 40 kg were left out of the 3.7 tons of liquid propane they had on take-off. If the jet streams had been less powerful, their attempt would have failed for lack of fuel. At that moment, Bertrand Piccard promised himself to fly around the world once again, but this time without any fossil energy. That’s when the idea of an aircraft powered only by solar energy, capable of flying night and day, came to his mind. He then turned to the Swiss Federal Institute of Technology (EFPL) based in Lausanne to conduct a feasibility study. The management of this study was entrusted to engineer and fighter pilot André Borschberg. The conclusive results enable both of them to launch together the Solar Impulse project in 2003. What is the message which this project tries to send? Solar Impulse is a program which has conceived and built an airplane able to fly day and night without fuel, propelled only by solar energy and which will complete the first round-the-world flight without polluting emissions. Our goal is to develop a symbol capable of promoting renewable energies and energy savings in an attractive way. Our success won’t be just to fly around the world without fuel; it will be to inspire people to implement measures to reduce their dependence on fossil energy. Could you throw some light into the technologies used that has made the aircraft stay in the air for more than 26 hours, even during night fall? To produce an aircraft that will take-off and fly autonomously both day and night, propelled only by solar energy, is a tremendous challenge that required the optimization of new kinds of technology and a drastic reduction in energy consumptions. The Solar Impulse was built after 7 years of calculation, simulation and testing. It possesses a wingspan of an Airbus A340, in order to minimize induced drag and offer maximum possible surface area for the solar cells. Its length is 21.85 m and height 6.40 m. It weights 1600kg, the weight of a family car. Every gram has been eliminated in order to build a super-light aircraft. Solar Impulse is built of composite materials, consisting of carbon fibre-honeycomb sandwich structure. The upper wing surface is covered with a skin of embedded solar cells, and the undersides of the wings with high-resistance flexible film. 120 carbon-fibre ribs placed at 50 cm intervals give the wing its aerodynamic profile as well as ensuring its rigidity. 11,628 mono-crystalline silicon cells cover the wing and the horizontal stabilizer. Each 150 microns thick were selected for their lightness, flexibility and output (22%). Its power is the average power of a scooter. Fitted beneath the wings of the HB-SIA are four nacelles, each containing a 10 HP motor, a lithium polymer battery set and a management system controlling charge/discharge and temperature. The thermal insulation has been designed to conserve the heat radiated by the batteries and to keep them functioning despite the -40° encountered at 8,500 meters above the Earth’s surface. Each engine is fitted with a reduction gear that restricts each 3.5 meters diameter, twin-bladed propeller to an RPM in the range of 200-400. The airplane flies without fossil energy by capturing solar energy through its solar cells. These cells transform the sun lights into electricity alimenting at the same time the engines and recharging the batteries for the night flight. At midday, each m2 of land surface receives the equivalent of 1000 watts, or 1.3 HP of light power. But over 24 hours this averages out at just 250W/m2. With 200m2 of photovoltaic cells and 12 % total efficiency of the propulsion chain, HB-SIA’s four engines achieve an average only 8 HP or 6 KW. That’s roughly the amount of power the Wright brothers had available to them in 1903 when they made their first powered flight. And what happens at Night? When HB-SIA is on the runway ready for take-off, the batteries are typically charged with solar power to minimum 50% for pilot safety. Aside from take-offs and landings where the aircraft speed is increased to 30 knots (approximately 55km/h) for manoeuvrability, the solar aircraft is always flown at 25 knots (approximately 45km/h), its design point for minimum energy consumption. The entire flight cycle revolves around energy savings and optimization. The aircraft essentially makes use of electric and potential energy. Electric energy or – to be physically correct, chemical energy is collected in the batteries. Potential energy is stored in the aircraft height. For example, a football on a hill has latent potential energy. As soon as it gets a slight push, it will roll down converting its potential energy in kinetic energy (speed) and eventually comes to stop because in real life, every motion is accompanied by losses. So in order to fly with the utmost efficiency, the Solar Impulse airplane needs to juggle the energy storage between height and battery to find the best equilibrium. During the day, the pilot slowly ascends to a higher altitude, around 8,000 metres, in thinner atmosphere to avoid turbulence and cloud formations. Interestingly, the solar generators also convert more energy at altitude. Sun radiation is partly absorbed by Earth´s atmosphere before reaching the ground. The higher Solar Impulse is climbing, the more sun power is available and can be stored in the batteries. In fact, for the highest possible solar power generation, HB-SIA should be in outer space; but that’s a little too far for the time being. As the sun begins to set on the horizon, solar power obviously decreases. 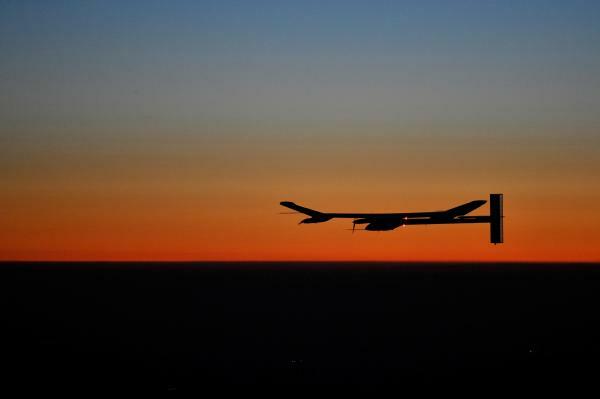 Once the available solar power is not sufficient to support level flight anymore, the pilot reduces the motors and initiates a gentle descent (about 0.4 m/s) to a low night loitering altitude of 1,000 – 1,500m meters. Out of its maximum altitude of 28000ft (8,000m), the prototype can glide for 4-5 hours consuming almost no electric energy. When the lowest altitude is reached, usually long after sunset, the motors, now powered by the batteries, are used to maintain a level flight at 25 knots until the morning. As the breathtaking tones of the sun on the horizon start filling the sky with warmth, the aircraft can once again begin its ascent, and the cycle begins. What is most incredible is that this revolutionary aircraft could practically fly perpetually into infinity if it weren’t for the human side of the pilots. What goes behind the conversion & usage of the Suns energy? The upper part of the solar airplane’s wings is covered by solar panels. These are solar generators, meaning that they convert sunrays directly into electricity. The panels together are constituted of a total of 12’000 solar cells which, in turn, are all grouped into “strings” of 300 cells. At the extremities of each string, just like in a battery, there is the positive (+) and negative (-) pole. Each string has what’s called a Maximum Power Point Tracker (MPPT) which is responsible for extracting the maximum amount of power from the panels at any given solar intensity. The energy is then either stored in the batteries (there are 4 total) or immediately converted into mechanical energy, triggering the propellers to move. There are 4 motors on the HB-SIA. W­hen the motors are not running, the energy that is processed is directly stored in the batteries. However, if the airplane is in flight, sunlight is used to fuel the motors. When the energy produced is more than what is needed to fly, the remainder flows into the batteries. The Battery Management System (BMS) controls this process automatically reducing the electric current into the battery according to its charging status. The BMS also monitors the battery temperature during flights, ensuring they are not too cold (lowering their productivity) or overheating (which can be dangerous). In simple words, the entire process is run through a chain of conversion. The cells convert sunlight into electricity; this electricity is channelled through the MPPT to get the maximum power output. The electricity can either be stored in the batteries or transmitted to the motors. The motors take the electricity and transform it into mechanical power, enabling the propellers to move and consequently the aircraft to fly. In flight, the pilot determines how much energy he needs depending on the speed of flight and how fast he wants to reach the desired altitude. What are the current limitations to the aircraft and how is it being addressed in HB-SIB, your next version of the plane? The HB-SIA is a prototype meant to show that we can fly day and night without fuel, solely based on solar energy. It was the first mile stone in demonstrating the enormous potential of new technologies for energy saving and the production of renewables. As so, the cockpit of this first airplane is indeed pretty tight, typical of a test airplane. The pilot can’t change positions. This plane was not designed to make longs flights. The 2nd airplane will integrate new technologies in all fields and will deliver a higher performance reducing even more our energy consumption, therefore having more reserve at our disposal. We are modifying as well the cockpit to improve its comfort for the pilot to allow him to fly alone many days and nights. The 2nd plane will remain, as the first prototype, a one seater aircraft. The two pilots, André Borschberg and Bertrand Piccard will take turns at each stop during the round the world flight. Are there any plans of flying the solar impulse to India considering the potential it has in renewable energy, especially in solar? Destinations for the flight around the world are currently being revised. No itinerary has been defined yet, but India will mostly likely to be on the way. A stop is always possible. How soon can we expect the “round the world” flight? Next Matt Damon has boycotted the loo!